Per Espen Stoknes is a Norwegian economist and psychologist, and is director of the Norwegian Business School's BI Center for Green Growth. In a recent lecture to SEI, Stoknes outlined the main psychological barriers to thinking constructively about climate change, and presented solutions to overcoming these hurdles. These findings are also elucidated in his new book: What We Think About When We Try Not to Think About Global Warming. These questions are motivated by what Stoknes terms the “climate paradox”. National studies show that since 1989 in the US and Norway, and since 2008 in Sweden, concern for climate change has been stagnant or even decreased, despite our scientific understanding of climate change and its effects increasing dramatically during that time. Furthermore, climate change doubt, complacency and/or scepticism of scientists is predominantly found in countries that are at the top of the scientific tree (US, UK, Japan, Australia, Germany) - China is a notable exception. How can we make sense of this irrational response? Stoknes argues that psychological factors explain why scientific certainty and public concern have been following very different trajectories over the last few decades. The key points from the talk are summarised below, please watch the presentation above or refer to Stoknes' work for greater detail and further explanation. In Stoknes’s model, the human psyche constructs five barriers to climate concern. Stoknes likens these barriers – the five Ds: distance, doom, dissonance, denial, identity – to concentric walls around the fort of the self. People struggle to engage with climate change because they perceive it as distant: temporally, geographically or socially. Climate science deals with timescales that may be out of our lifetime or beyond the scope of our imagination – or at least beyond our sense of urgency. In climate reports we see images of geographically distant mountain glaciers or Arctic icebergs, which we may feel little innate connection to. When people are featured in climate-related imagery these people are usually socially distant from people in the English-speaking world (who have the greatest proportion of climate doubters). Stoknes argues that we simply have less empathy with increased social distance. Climate change is often perceived as a somewhat nebulous, technical problem that is mulled over by technocrats and bureaucrats at international conferences in circular halls, where every desk has a microphone and a little flag. In this sense it can seem to exist in a different realm - likewise the responsibility for dealing with it appears distant. Psychological distance from a problem reduces the urgency we associate with it. When we have so many immediate issues, challenges we perceive as distant settle to the bottom of our priority lists. Stoknes surmises that we have a kind of “apocalypse fatigue” when it comes to climate change. When over 80% of media articles use a catastrophe narrative for climate change we become tired of and perhaps desensitised to these doomsday scenarios. This leads to avoidance of such messages and negative stereotyping of the messengers. Unless you’re this guy, the chances are your actions conflict to some extent with your knowledge about what individuals need to do to collectively address the carbon-climate problem. Stoknes calls this disparity cognitive dissonance. The cognitions in this case are along the lines of: “I have a high carbon footprint” and “Carbon dioxide emissions change the climate state, with bad effects for us”. We cope with this dissonance in a number of ways. We might modify one or both of the cognitions to make them compatible, change the importance of one, deny the cognitions are related, or justify our behaviour by adding other factors – eg. “I’ve just installed solar panels so my long haul flight doesn’t matter”. When people have cognitive dissonance they may latch on to sources of doubt to help remove the dissonance. In Stoknes’ words, cognitive dissonance creates a demand for doubt. This is a key reason why climate sceptics have remained influential despite the overwhelming consensus in the scientific community. This one is simple: we have a certain capacity to live as though we do not know what we know. Aspects of our lifestyle are tangled up with our sense of identity. If these aspects of our lifestyle (for instance, the car we drive) are criticised, it can make us feel uncomfortable. Products of this discomfort are defensiveness and confirmation bias – we search out arguments that help us justify the feature of our identity which has come under threat. These are the barriers – but how do we negotiate them? In Stoknes’s view, we need a new climate communication toolbox. In this toolbox lie five solutions: make the narrative social, make being low-carbon simple, focus on opportunities, sell the dream not the hell, and use climate-relevant signals that people can connect to. From Stoknes (2015) What We Think About When We Try Not To Think About Global Warming. Copyright: P. Stoknes. To overcome the distance barrier, we need to make climate issues social and local. We can also make use of the fact that humans are social animals and care innately about how we compare to our peers; a study by US company OPOWER showed that people are most likely to cut power consumption because their neighbours do it rather than for the sake of: sustainability, future generations or because it is profitable. This effect also been observed through the contagious spread of rooftop solar panels. Stoknes cites simple changes that can reduce waste and help consumers make good decisions. These include decreasing plate size (this can reduce food waste by 20%); making the life cycle price on an item in a shop salient, rather than just its instantaneous cost; the power of default - making it the default option to offset carbon when buying flights or to use both sides when printing documents. People love opportunities, hence the popular success of ideas like solar roadways and brands like Tesla. Stoknes argues that we need to readdress the balance of catastrophe to opportunity in climate change dialogue, alluding to studies of creativity in which people were more creative immediately after watching a positive film than a scary movie or documentary. In Stoknes’s view, the optimal ratio of positive:catastrophe narratives is 3:1, whereas currently it is 80% in favour of the catastrophe framing. The recommended 25% catastrophe content is important to underpin the discussion with an acknowledgement of the possible disastrous consequences of climate change. Stoknes also conjectures that framing climate change in terms of health could be effective. George Loewenstein points out that “Martin Luther King didn’t say ‘I have a nightmare’. He said, ‘I have a dream’. And that’s what made people willing to put their bodies on the line, to bring that vision into being.” To Stoknes one big problem is that we lack a credible dream: a Yale-based survey showed that only 4% of Americans are optimistic that humans can and will reduce global warming; amongst the rest that acknowledge climate change, respondents either think we can't (18%), could but won't (26%) or that it is unclear whether or not we will do what's necessary (42%). Stoknes makes a witty comparison to the stone age, pointing out that it didn’t end because of a lack of stones. Similarly with a little ingenuity and determination we can end the fossil fuel age before the reservoirs are exhausted. What will help to support this dream is to tell stories of low-carbon transitions occurring around the world that are happening, and that can happen. People can find it difficult to connect to climate system indicators, such as the atmospheric ppm concentration of carbon dioxide, millimetric annual sea level rise, increases in ocean heat content or even globally averaged surface temperature change. Sometimes these signals are also clearly so big that they dwarf us and mute our sense of self-efficacy, discouraging engagement. In terms of utilities, most people struggle to grasp what a kilowatt hour (kWh) is or to visualise gas consumption in terms of cubic metres. We might find it easier to engage with the amount of power we are using per month in terms of its monetary cost, or as a comparison to our neighbours. If our bank statements displayed our monthly carbon footprints, we would find it easier to engage with our personal consumption. Copenhagen is currently doing this on the city scale – tracking their greenhouse gas emission per capita against their gross value added per capita. Are we inevitably – and inescapably – short-term thinkers? Per Espen Stoknes doesn’t think so. But we do need to be smart about how we communicate climate change in order to make long-term thinking and action compatible with our irrational human tendencies. 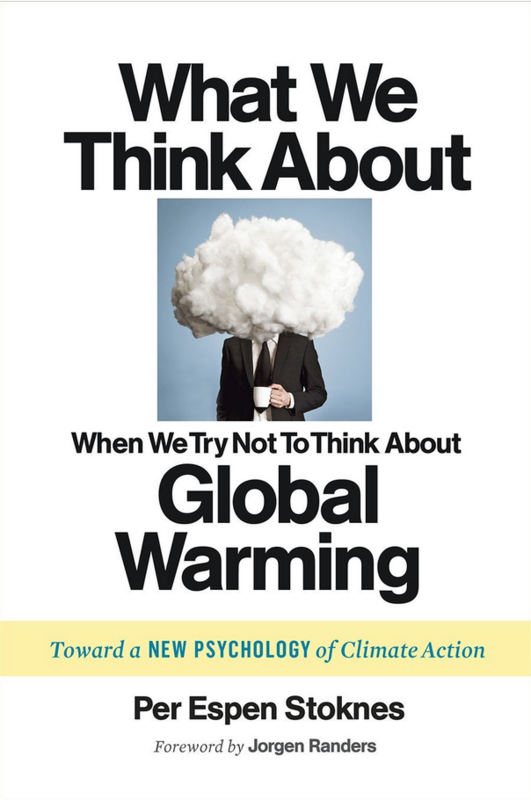 Per Espen Stoknes (2015): What We Think About - When We Try Not To Think About - Global Warming; The New Psychology of Climate Action. Chelsea Green Publishing. Stoknes' slides from the seminar "Why Our Brains Ignore Climate Change - and What to Do About It"